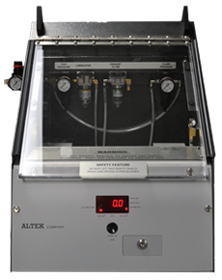 The MODEL 9009C4 End Buckling Test Station is used to determine the pressure at which an unseamed beverage end fails. The failure pressure is registered upon buckle or tab blowout of the free end. An appropriate set of Change Parts, determined by end being tested, is installed on the unit. An end is clamped in place and a test sequence is initiated. 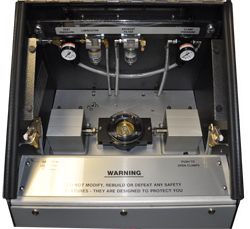 The end is pressurized at a pre-determined rate until it fails; the pressure at which the end failed is indicated on the front-panel mounted digital display. This unit requires the use of Change Part 9818. Click Change Part number for further information. Click here to view PDF of complete product information.